• There’s the Big Dipper! And the Little Dipper! And … well, that’s probably it. As trained as you think your naked eye is, it wouldn’t hurt to take a few lessons from a professional. Enjoy STARGAZING tonight at Snowbird Resort where local astronomer John Baranca teaches you the names of some lesser-known stars and constellations, and what to look for in the night sky. Then, take a tram ride up 11,000 feet to see the clear skies through high-powered telescopes. In no time you’ll be exclaiming, “There’s a Jupiter-Antares pair, with Arcturus shining in the Western sky!” Stargazing @ Cottonwood Room, Snowbird Center, Level 2, Hwy. 210, Little Cottonwood Canyon, 933-2222, 8 p.m.
Monday 9.3 Spend your Labor Day exerting no more energy than it takes to drive and park (or take TRAX) and sit down at Franklin Covey Field to see the SALT LAKE BEES play the Las Vegas 51s. Cheer on the Bees in their final regular season home game while drinking beer and eating—and, assuming you’re enjoying a paid holiday, reminding yourself that you’re earning wages while rooting for the home team. And if you do have to work today, hey, there are always the fireworks for the FAN APPRECIATION NIGHT on Saturday. Salt Lake Bees vs. Las Vegas 51s @ Franklin Covey Field, 77 W. 1300 South, 2:05 p.m. SLBees.com; Sept. 1: Fan Appreciation Night, 7:05 p.m.
Tuesday 9.4 Long before Sept. 11 became known as an American nightmare (and referred to simply as 9/11), it was the date of the Mountain Meadows Massacre—a violent act that, coincidently, was also carried out in the name of God. But, although 9/11 is still a fresh wound, the massacre is barely acknowledged, especially in a state where many wish to ignore it. WILL BAGLEY, author of Blood of the Prophets: Brigham Young and the Massacre at Mountain Meadows, speaks in commemoration of the 150th anniversary of the event—and as part of Ken Sanders’ monthlong series of events marking its 10th anniversary—tonight. Will Bagley @ Ken Sanders Rare Books, 268 S. 200 East, 521-3819, 7 p.m.
• Ever since J.K. Rowling’s little wizard joined the ranks of Young Adult literature, it became clear that genre labels only go so far. That’s why you shouldn’t miss MARGO RABB during her stop at The King’s English tonight, promoting her latest young adult book Cures for Heartbreak. The author of the Missing Persons series, Rabb has plenty of work to hook new readers. Besides, what are you going to do now that you’ve finished the final Harry Potter book? 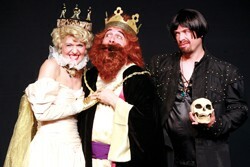 Margo Rabb @ The King’s English, 1511 S. 1500 East, 484-9100, 7 p.m.